So there are two, diametrically opposed trains of thought within cycling, these days. These are the stealthy fitness and the showy fitness. The first has been around for a while, and the second, a more recent event linked to our modern, mobile, social media age. For as long as there has been competitive cycling, there has been stealth fitness. This is best illustrated by an e-mail that was circulated about a decade ago, and attributed to one of Chris Carmichael’s CTS coaches. The old e-mail stated that cyclists were the biggest fitness liars and stealth trainers. We say one thing, but it quickly becomes evident that we mean something completely opposite. This has been the prevailing attitude for generations of cyclists. Everything is very secret. Every play is close to the chest. Sunglasses on cyclists were not to protect one’s eyes, there were to hide any tells, hide anything that might indicate fatigue. Or, possibly, hide just the opposite. Exhibit A: Lance fakes being tired during the ’01 TdF stage of Alpe D’Huez. Lance and the Posties pretend The Boss is suffering, prompting Jan Ulrich’s Team Telecom to drive the pace to the base of the storied climb, basically tricking the German team into doing all the heavy lifting for the day, before the Texan’s famous “Look” and the trademark attack to grind Ulrich down and eventually win that Tour. I want to keep track of my miles and my workouts, but now there is no hiding from my sea-level buddies who will join me on Ride the Rockies this year. My California friends ride every chance they get. One commutes through Orange County, while the other trains for marathon rides, like the Breck Epic and Leadville 100. Our friend from Texas is an Ironman. I’m a giant track sprinter who happens to live at 7,500 feet. I can’t let these guys embarrass me in my home state, in spite of the fact that I out weigh each of them, some by significant margins. I’m Altitude Man. But I can’t hide the training, either. I suppose it will keep me honest. They can see what I’m doing, and I see the miles they are putting in. It’s more positive, even inspiring. We can cheer each other on. Give each other kudos. We can recognize the efforts and the KOMs. We can act like teammates. Of course, there are still the rollers . . .
Have fun. Be safe. I’m going riding! When we left our heroes, they were being buffeted and blown all over Trail Ridge Road’s highest points by gale-force winds . . .
We were never so happy to get down and back into trees. And while the wind persisted all the way into Estes Park, it was never so bad as on the alpine tundra. Riders arrived just in time to see one of my favorite weekly events, the Estes Valley Farmers Market, as the market was closing for the day. The town wanted to make room for the riders events later in the evening. Local bands, including Amplified Soul, performed for the riders as local venders offered their wares. It was fun but it was a brief night, as most riders were tired from the short but challenging day through the park. Donald at the Estes Valley Farmers Market. Amplified Soul plays at the RTR event in Estes Park. This particular stop was the whole reason I could not resist the pull of RTR this year. This was the chance to show off my little town. I have lived in Estes Park for 16 years and love promoting it. I also got to sleep in my own bed, and offer Donald a spare bed. It made for a wonderful night’s sleep ahead of the Grand Arrival, the final day of riding. The last day of RTR2016 was a relatively short 51 miles. Starting in Estes Park, we rolled down the Big Thompson Canyon. The long line of riders snaked and plunged through the canyon, tracing the Big Thompson River until the famous and popular Masonville ride. Riders ambled through the countryside west of Loveland toward Horsetooth Reservoir. Then, the final climbs. Horsetooth consists of four hard, steep, short climbs. All of them between 6-10 percent. A bit of a sting in the legs. 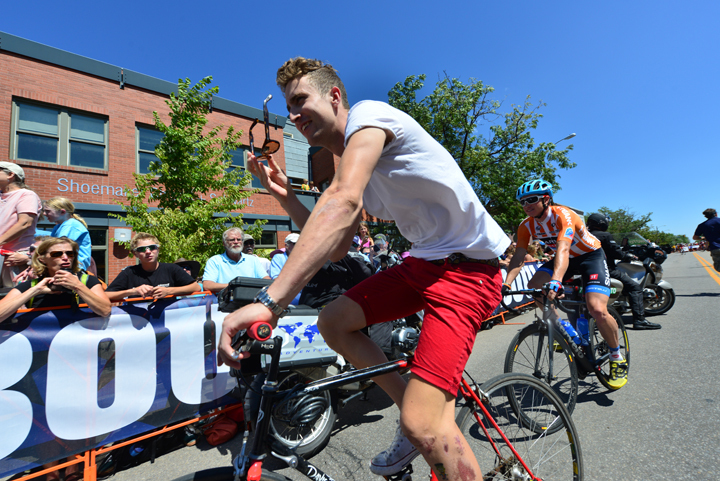 After the last descent around the north end of the reservoir, riders enjoyed a sort of precession through the beautiful neighborhood on Mountain Avenue, eastward into Old Town Fort Collins. We rolled into O’Dell Brewery for food, entertainment and closing festivities. Donald Lewis and the author pose at the finish in Fort Collins. After a week of riding and more than 400 miles, we had arrived; tired, short on sleep and as happy as we could be. The arrival is always bitter-sweet. We see each other for one week, once a year. We share stories, we catch up on lives outside of the tour, and for a week, we are a large, rolling family reunion. When we roll into the final stop, we have to say our good-byes. One good-bye was going to be a bit more permanent. Tour Director Chandler Smith was stepping down after eight years. Chandler challenged riders and adapted to last-minute challenges, himself. Just in my five additions, Chandler had to change two tour routes due to wildfires, and had to sag riders all along the Berthoud Pass climb on the first day of the 2014 RTR. He has served us well and advanced the RTR, improving the event and, hopefully, improving relations with the beautiful little towns in this amazing state. Ride the Rockies has been a great tour for a long time. Each rout, even when closely paralleling previous routs, offer a new adventure. Chandler, Renee, Liz, Betsy and the army of volunteers, once again, gave riders a week to remember, about which to reminisce, and stories to retell.What more could we want. Thanks for the memories, and may luck smile on you, Chandler. I’m working a lot lately. Facing some challenges that I’m happy to have. I haven’t posted in a while. Just tying, as I often do, to find time and just do it. One new challenge is riding rollers. A friend gave me a set about a year ago, but I never got the technique until this week. I hope to get a bunch of miles on the rollers as the winter snow stubbornly hangs on. Another project has been recording interviews at my local bike shop. Via Bicycle Cafe is the lone dedicated shop in Estes Park and I really want it to thrive. The shop not only sells Scott, Salsa and Colnago bikes, Stefano Tomasello, the owner, is a pro wrench and a Cat 2 racer. 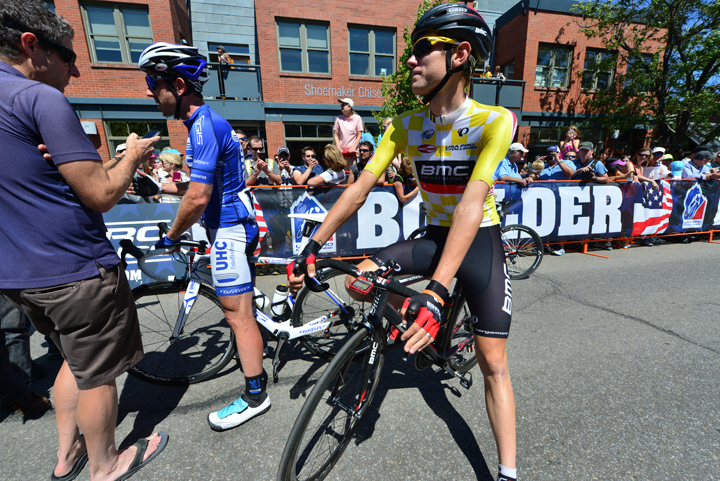 He hopes to gain enough points this season to move up to Cat 1 before ending his competitive cycling career. The other side of the shop is a great coffee bar. Stef serves locally-roasted Notch Top coffee, as well as a variety of goodies for riders. 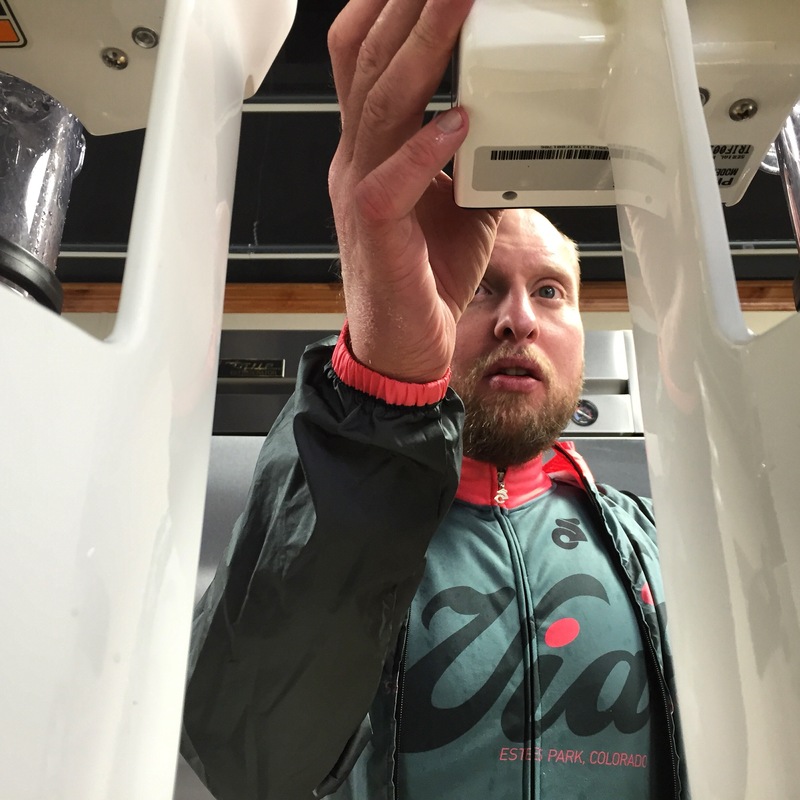 Stef takes as much pride in making a great cup of coffee as he does working on bikes. I hope to get plenty of rides in with Stef and the bike community that has quickly sprung up around his shop. I plan to have more on the shop, but until then, have fun, be safe. I’m going riding. 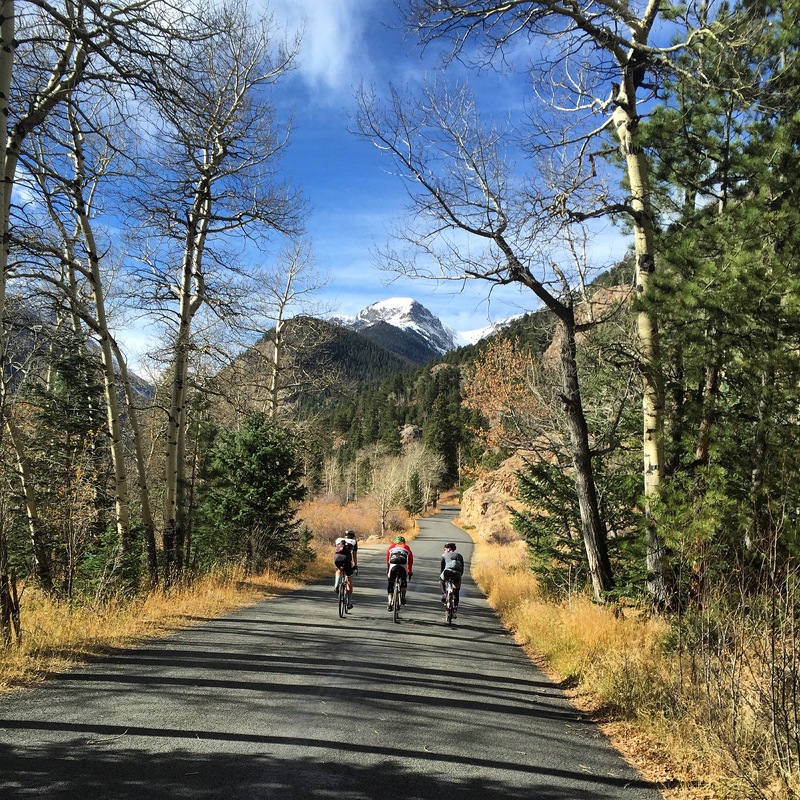 A trio from Estes Park pedals toward the Old Fall River Road in Rocky Mountain National Park. Stefano Tomasello, foreground, points back toward town on the Old Fall River Road. Stef’s idea for opening his shop was to provide a hub for the local cycling community. 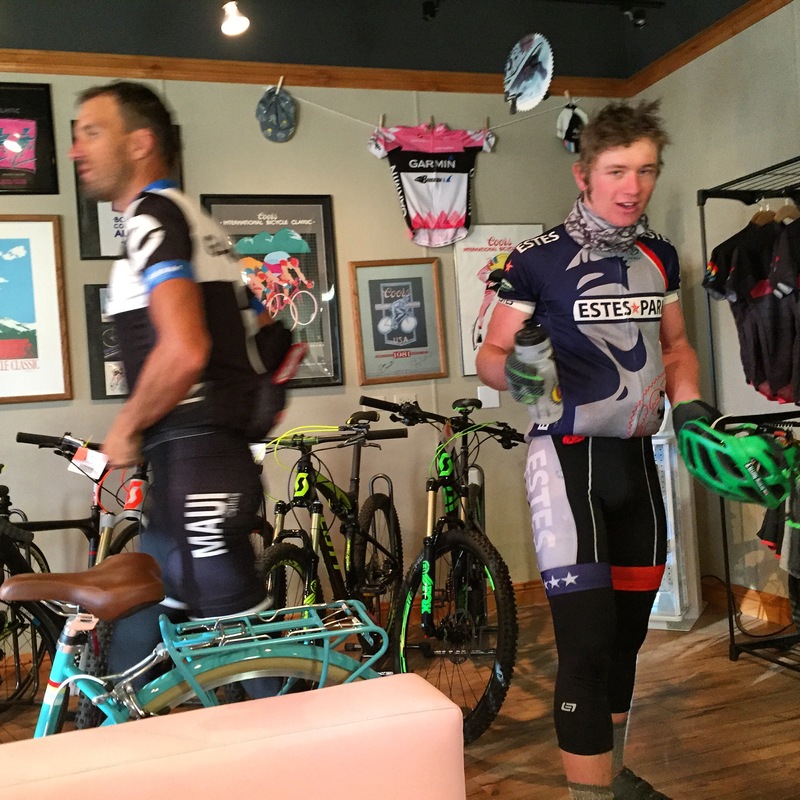 Josh Cramer, left, owner/operator of Notch Top Coffee, and high school cyclist Jeremy Norris, mill about Via Bicycle Cafe last fall. The shop is as much about the cycling community as it is the bikes. Tomasello brews a cup of coffee in what he describes as a giant Keurig machine. Stef, as he is called by much of the community, is as passionate about coffee as he is cycling. 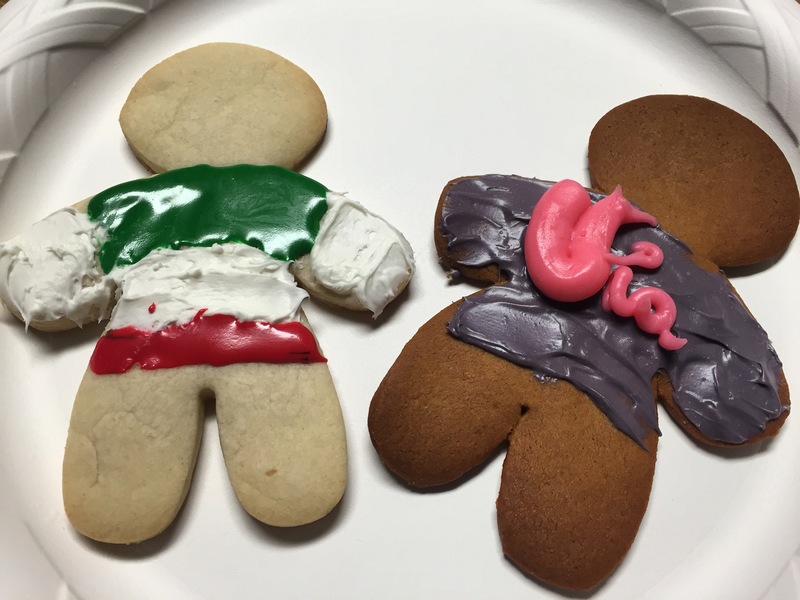 Holiday cookies bare Italian national colors and an approximation of the shop jersey. While Via has been open to the public for less than six months, the local community has embraced the shop. 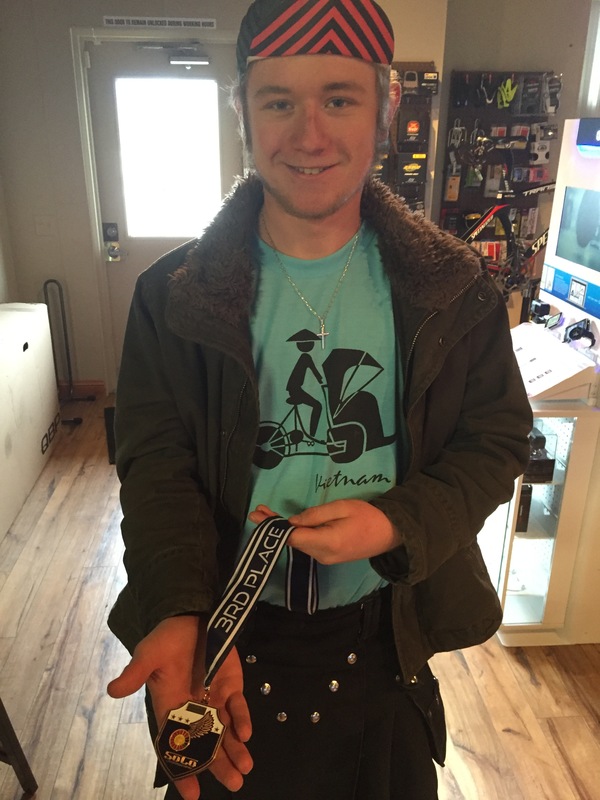 Jeremy Norris, member of the Estes Park High School mountain bike team, shows off his medal from the Colorado State Cyclocross Championships. Via has quickly become that spot to celebrate achievement and share stories. 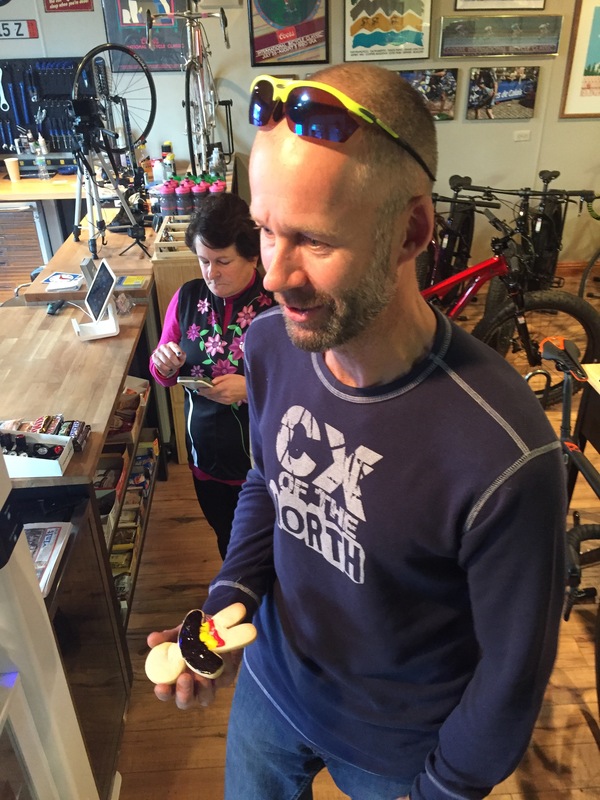 Steven Wens, Belgian national and Estes Park resident, holds a cookie with the Belgian colors at Via after the Colorado State Cyclocross Championships. Cyclists of all abilities have embraced Via for it’s friendly vibe, as well as great, locally roasted coffee. 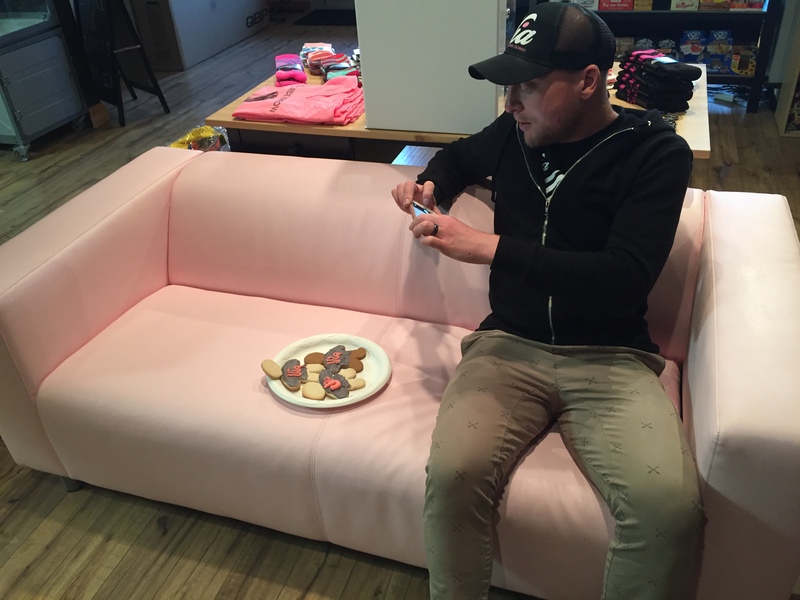 Stef sits on what has become his shop’s trade mark pink couch. As his name implies, Tomasello is Italian, by heritage, and loves the iconic hue of the Giro d’Italia. Stef pulls an espresso shot for an eager customer. 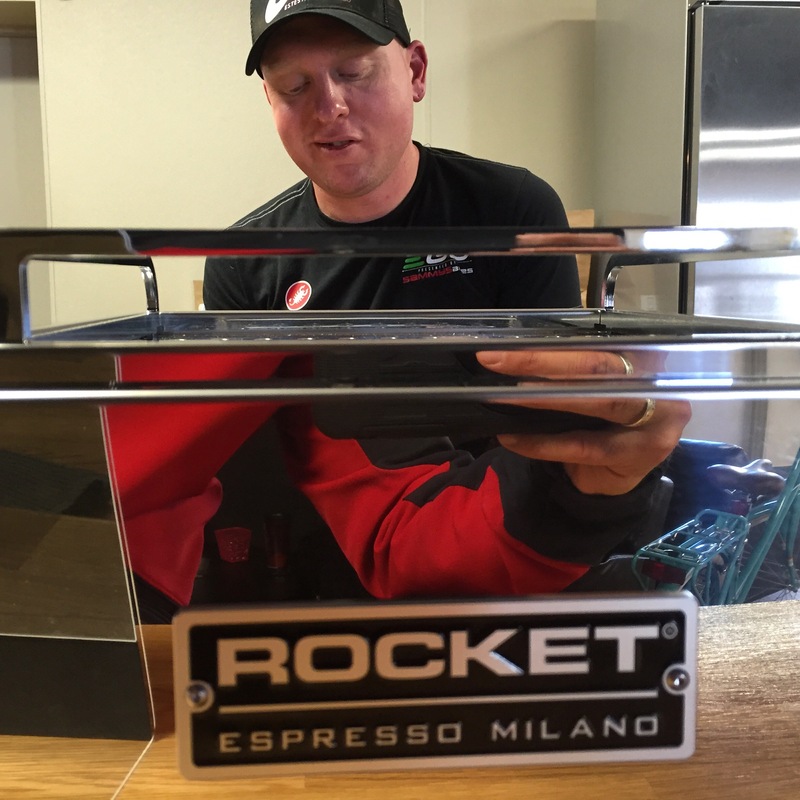 In addition to several bicycle brands, Tomasello also sells high-end espresso machines. May is painted pink on the international cycling calendar. Pink is the color of victory. Pink is the color of triumph. Pink is the color of legend in Italy. The Giro d’Italia is slated to begin next Saturday along the Mediterranean coast with a team time trial, as this race so often does. For those of us just escaping winter’s icy grip, or those still trying to shake it off, the palm trees of Sanremo are the signs of hope, of the summer soon to arrive. To see the tight, double-paceline of the team time trial blasting past the sea and the swaying palms brings lightness to hearts and freshness to tired legs, as well as a new vision to eyes too long inside on the stationary trainer. One of Italy’s favorite sons, and 2013 champion, Vincenzo Nibali, has chosen to focus all energies on the Tour this year, so there will be no pink and Astana turquoise this season. Nairo Quintana of Movistar and Sky’s Chris Froome have also decided to skip the Giro to better prepare for the TdF. All eyes will be on a different Spaniard as El Pistolero, Alberto Contador, attempts the Giro-Tour double. Contador will lead a slightly disheveled Tinkoff-Saxo squad through Italy without the help of master tactician and team founder Bjarne Riis. Riis was jettisoned from the squad after a falling-out with Olag Tinkoff, the team owner. In spite of being the Yankees of the cycling world with such stars as Contador, former two-time Giro champ Ivan Basso and Slovakian sprinter Peter Sagan, the team has little to show for their extravagant payroll. I suppose that makes them more like the Knicks than the Yankees. A bit of history; the last Giro-Tour double-winner was tragic cycling hero Marco Pantani. Il Pirata took both grand tours in 1998, forever sealing the little climber’s name in cycling lore. 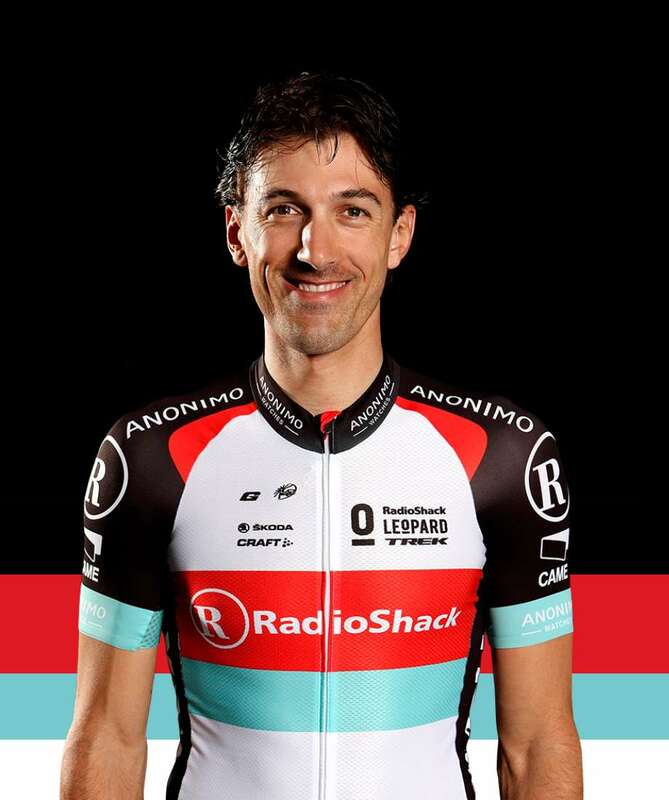 Unfortunately, the diminutive, enigmatic Italian was booted from the Giro in 1999 at Madonna di Campiglio, for doping, with one mountain stage remaining and while wearing the Maglia Rosa. 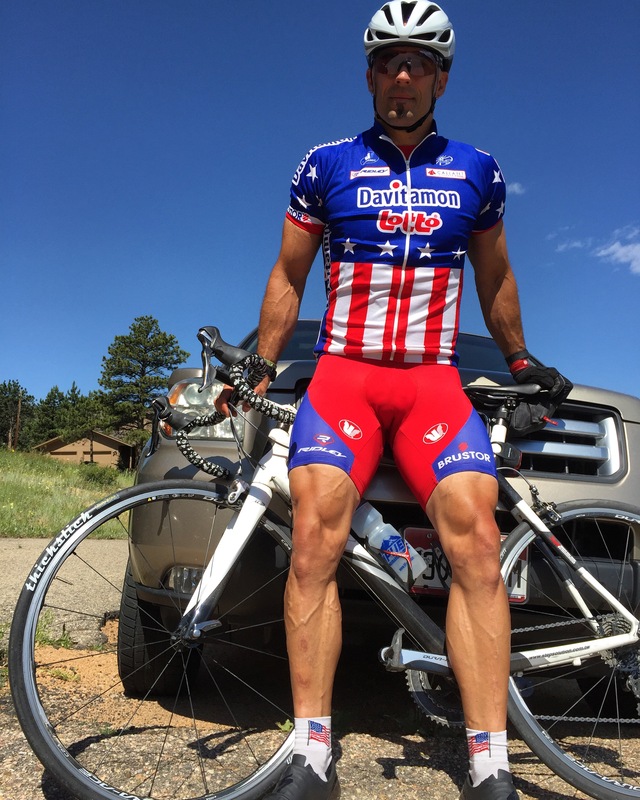 He was suspended from competition for the remainder of that season, and while his career never fully recovered, he had enough fire in his heart and his legs to treat cycling fans to an epic battle with fellow doper Lance Armstrong during the 2000 TdF. The little pirate would die of a massive cocaine overdose, alone in a Rimini, Italy, hotel room on St. Valentine’s Day, 2004. Now I can not officially endorse using the Shimano Ultegra 11-32 cassette with the top-of-the-line Dura Ace derailleur. One should probably take the advice of the experts and manufacturers and buy the Ultegra long-cage rear derailleur, as it is designed to fit this cassette. So, pay no attention to me when I say WOW DO I LOVE THE WAY THIS SETUP WORKS! I had a tough Ride the Rockies last year when, on day one, we climbed out of Boulder and up the 11,306-foot Berthoud Pass. Snow and the climb made for achy knees. Day four involved an interminable climb from State Bridge to Avon. My knees have never hurt quite so much. This is when I vowed to get a better climbing gear. So I have. I actually have all of the proper equipment. I have the Ultegra derailleur in a box in the workshop. I just don’t want to haul it to Boulder to have it put on. I could do the job, but I don’t want to replace cables and housing, for which, again, I would want to travel to Boulder, about 36 miles down the canyon. So far, I have had no shifting issues. I have not taken it out on anything truly steep, yet. I hope to do that next week. I’ll let you know how it goes. While pink is the color of May, July is decidedly yellow. 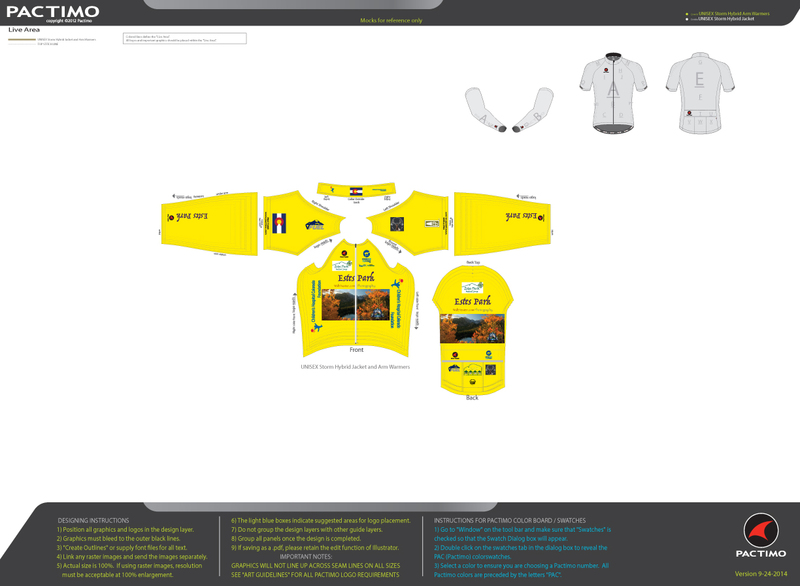 So is my team’s jerseys for July’s Children’s Hospital Colorado Foundation Courage Classic. That’s officially how one is supposed to mention the event on first reference. I’ve been in “The Media” for a while. So the Courage Classic is a fund-raising event for the hospital foundation. It’s a great organization, a good cause and probably the best ride I do each year. I mention it now because I need to start raising donations. The Courage Classic itself is the payoff for raising funds. It’s three days of riding through the heart of Colorado’s ski country, as well as at least one classic route. This year’s ride starts, as it did last season, with the Copper Triangle; 80 miles from Copper Mountain Resort, up to Leadville, the highest town in North America at 10,200 feet, down through Minturn, through Vail, and up the steeper west side of Vail Pass, before plunging back down into Copper. Day two is a bit different than in years past. 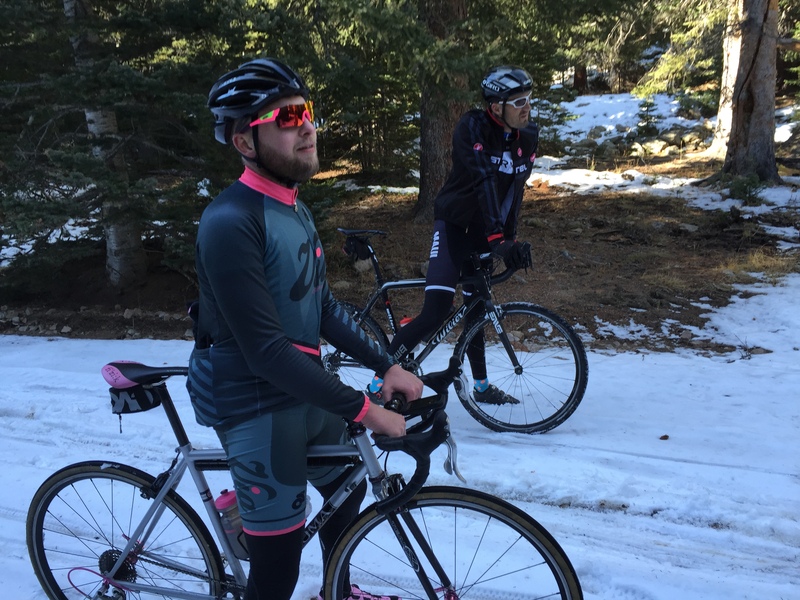 This year, riders will start in Copper, zip down the bike path to Frisco and Dillon, around the east side of Lake Dillon, on to Keystone, over Swan Mountain, through Breckenridge, then up Hoosier Pass, then returning to Breck and finishing in Copper. Day three is relatively short, just about 35 miles from Copper to Breck and back to Copper for the final BBQ party. If you are interested in joining the team, we are Team Estes and have been together in various forms for six years. We tend to be pretty small, but we have a great time. The ride runs from Saturday, July 18, through Monday, July 20, based out of Copper Mountain Resort in Summit County, Colorado. Follow this link to donate to our team for the ride. Thanks for your support. I still have about two weeks before I can test out my new Shimano Sports Camera and its iPhone app. I still have to buy the tiny media card. When I do finally get the card, I will be sure to record one of my favorite descents to test it out, then post here. Until then, have fun, be safe. I’m going riding! My team’s 2015 jersey, by Pactimo. My design! I shared recently that I once bought a ‘cross bike specifically to commute from the Denver suburbs into downtown for school and work. I lived in Golden and commuted, making for a 30-mile round trip, then to Littleton for a 20-miler. I did it back in Omaha, as well, equally as long. But I didn’t think of it as the grind to work, It was my chance to get my head, my attitude, right before stepping into a cubical or classroom. It was my time to meditate. 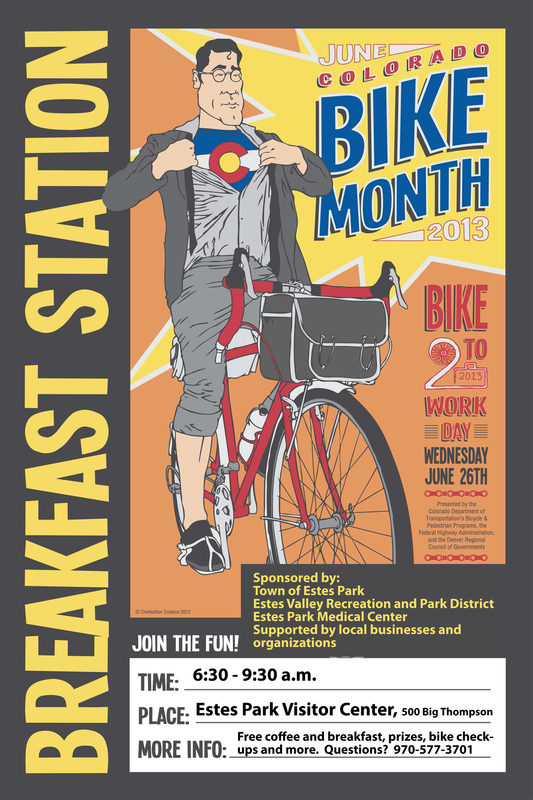 Wednesday, June 26, is Bike to Work Day in Estes Park. The event runs from 6:30-9:30 a.m. and is sponsored by the Town of Estes Park, the Estes Valley Recreation and Park District, the Estes Park Medical Center and supported by local businesses and organizations, such as Kind Coffee. If the endorphins flooding your bloodstream isn’t enough, how about coffee? The organizations will offer breakfast that morning at the Estes Park Visitor Center at 500 Big Thompson Avenue. Plumbers and contractors might have a difficult time pulling this off, but if you don’t have 100 pounds of gear and have a functioning bike, this would be worth the effort. I had the chance to speak to several cycling visionaries and luminaries while out on Ride the Rockies. One of them was cycle coaching guru Chris Carmichael. The video is not yet up as I write, but should be by the time you read. Look for it either here or look for me on YouTube. Look up Where’s Walt. At any rate, Carmichael has authored two books for those of us who have jobs and families and obligations. The Time-Crunched Cyclist and Time-Crunched Triathlete give suggestions to make a training schedule out of the time you have and make the workouts count. Carmichael told me that athletes can and do train adequately with only 6-10 hours a week. He also pointed pout that nearly as important as quality workouts as quality recovery. I know as well as anyone that sleep is sometimes not a priority. This can lead to chronic fatigue and symptoms of overtraining. We should get, just like every doctor tells us, seven and a half to nine hours of sleep to fully regenerate. Some folks feel they can get by just fine on four to six hours, but studies have shown that except in a tiny percentage, like ultra marathon legend Dean Karnazes, this is simply not true. We will always work better after better rest. I apologize for not getting a great example of great recovery out on RTR. I spoil myself in two ways, once each, during the ride. After the toughest day, I will get a massage. I recommend this for anyone, rider, runner, swimmer, parent, whomever. It is worth every cent you spend. This ride, I got mine after the 91-mile day that included the ascent of Wolf Creek Pass and the fast, flat ride into Alamosa. It works wonders. The other thing I like to do on big events is get my own room on the last night on the road. I like a particular hotel chain because they serve free breakfast and usually have a pool. It allows me to get a bit better rest when I’m not worried about the guy with sleep apnea buzzing like a chainsaw two sleeping bags away. The result was much fresher legs the next day. If you are training for an event and at home, make sleep as much a priority as the workout. We need both. Don’t skip the last hillclimb and don’t skip the last hour of sleep. Have fun, be safe. I’m going riding . . . then to bed. If last week’s Tour of Flanders is any indication, there are only two riders contending for cobbled wins this season: Fabian Cancellara and Peter Sagan. The two have traded off winning the northern classics this season. Sagan won his first spring classic by just riding away from Tom Boonen and Mark Cavendish at Ghent-Wevelgem a few weeks back. He took a sprint at the Three Days of De Panne and wheelied across the finish line. The only rider able to tame the 23-year-old Slovak champion is Spartacus. Fabian Cancellara beat Sagan and the rest of the field at the the E3 Harelbeke two weeks ago. 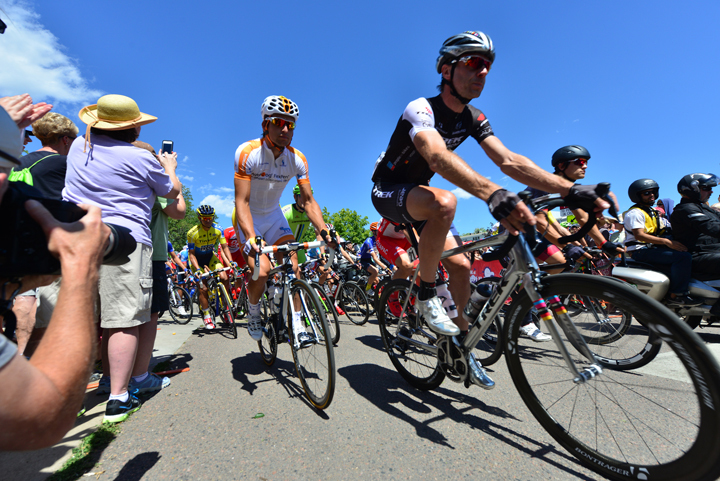 Many cycling writers were excited about the showdown with Spartacus, Peter the Great and Belgium’s Tom Boonen. The showdown fizzled a bit. Last year at the Tour of Flanders, Cancellara hit a wayward water bottle and crashed in the race’s feed zone, resulting in a broken collarbone. This season, Tornado Tom crashed out, leaving Fabulous Fabian to run free. Cancellara hit the Oude Kwaremont, a climb averaging 4 percent, but kicking up to 11 percent at 17 km from the finish, and rode away from all but Sagan. Cancellara hit the gas again on the last rise, the Paterberg, leaving Sagan gasping and all others far behind, taking the race by better than a minute. With Sagan skipping Paris-Roubaix and Boonen on the mend, Cancellara is nearly a prohibitive favorite to win his third “Hell of the North”. The bikes used on these Cobbled Classics have become a hot commodity. The Specialized Roubaix, with its Zerts inserts and comfortable geometry has been a favorite for casual riders for nearly a decade. My bike is the 2004 version, and the newer editions are quite common on organized rides around the state. The tag line for this bike is a comfortable bike is a fast bike, and the Roubaix is the best, though not the only, example of this. The idea of a comfortable race bike, an endurance road bike, one that is light, nimble and still able to soak up road noise, has become so popular among recreational riders with a taste for speed that several manufacturers have jumped on the band wagon. Trek made the bike that Cancellara powered to the Ronde win on Sunday. The Trek Domane is the Waterloo, Wisconsin manufacturer’s answer to it’s California rival. The Domain 4.0 can be had for just over $2,000, comes with the relatively inexpensive Shimano Tiagra compact (50-34) gearing. Like any of the bikes at the entry level, it will weigh between 17-19 pounds. The Giant Defy Composite 3 weighs just a whisker over 18 pounds and sports the same components as the Trek. Giant is an Asian manufacturer with the reputation of building plenty of frames with different labels. They know what they are doing with carbon frames. They make a whole lot of them, so their entry-level Defy will set you back a mere $1,700. Swiss manufacturer BMC took a different tack, returning to the nearly-forgotten material of aluminum for their Granfondo GF02 bike. The $1,899 bike comes with Shimano 105 compact components, one step up from the Tiagra group. The frame is based on the carbon version that American Tyler Phinney is riding around the cobbles this season. It tips the scale at 19.1 pounds and shares much of the vibration-eating geometry of its much pricier carbon iterations. The entry level carbon Specialized Roubaix, the Sport Compact, comes with Shimano 105 compact components and weighs around 18 pounds. It comes with their four-position adjustable stem and, because it is the bike that started the trend, gobbles the cobbles. It tends to be smooth and fast, though if you have the means and tend to be a weight-weenie, you may want to shell out a bit more than the $2,100 MSRP of this model. We now sit eight weeks from the start of Ride the Rockies. The total milage for next week should come to 80 miles, 30 for the weekend ride and three more rides during the week totaling 50 miles. If you haven’t started already, it’s about time to insert some climbing, some short sprints and most definitely a group ride into your training. I will actually have a taper this week as I have a real race, the Haystack Mountain Time Trial, on April 13. I might not get all of the miles in, but I will get some intensity in. If you find yourself short on time, there is at least one thing I can suggest . . . intervals. On a relatively short ride, after a 15-20 minute warmup, take a few hard digs, close to your maximum effort, for no more than a minute. Take a good recovery interval and repeat at least four time. The toughest and most effective interval workout I know of is the dreaded Tabata Protocol. After a good 20-25 minute warmup, set a timer for four minutes. In those four short little minutes, go as hard as you can for 20 seconds and recover for just 10. This is as hard as it gets, but yields the most benefit in a very short period. Give it a try if you feel you need to train but only have half an hour. Better get a bucket . . .